In episode 7 of the Surf Simply Podcast, the team spoke about the importance of understanding the volume of your surfboard, and it’s relationship to your size and weight. There have been quite a few people who’ve emailed asking for more details on this, so here’s a brief run-down of some of the things I was talking about. 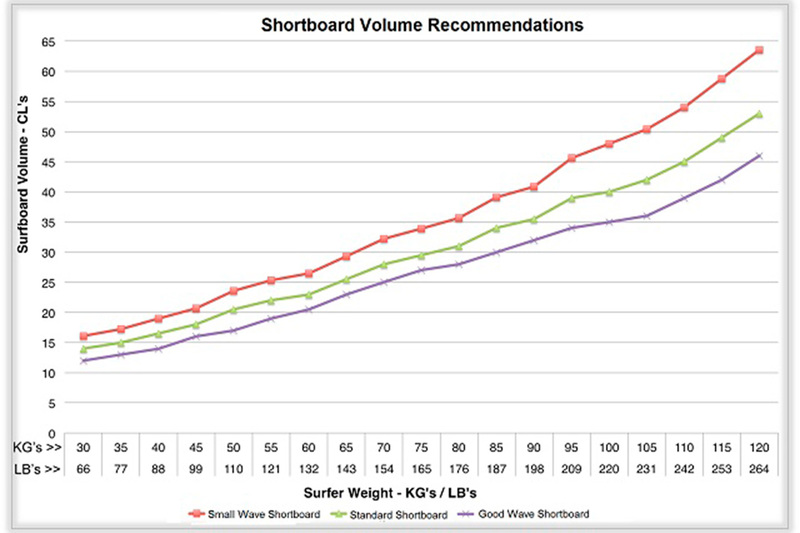 Nowadays with most boards designed using computer software, it’s easy to calculate the volume of a finished board, and most of the leading brands display the volume of their boards both on their websites, and increasingly on the surfboard itself. 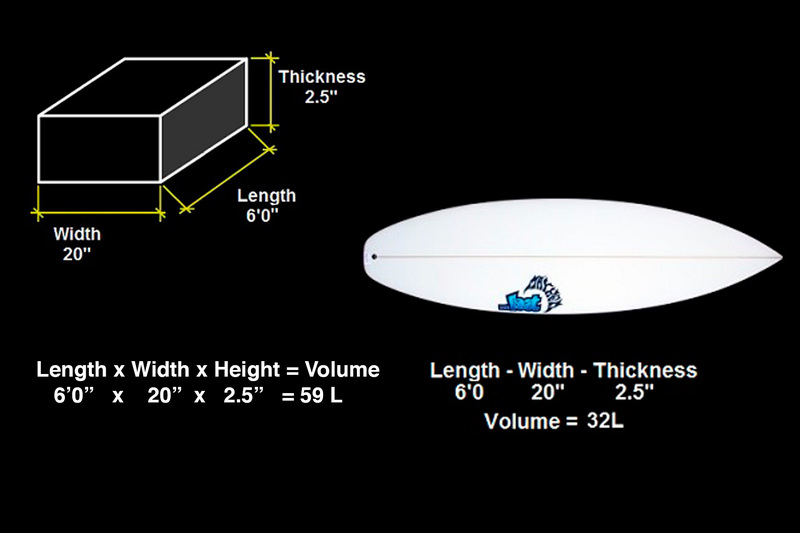 As some ballpark figures, an average shortboard would probably be around 25-35 Litres, while a 7’ funboard would be between 40-50L. 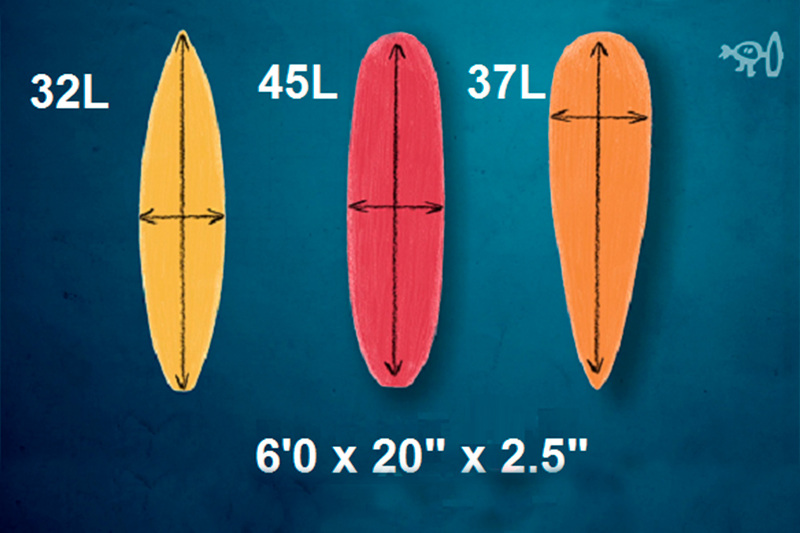 A longboard might go from 60-100L, and an SUP could easily top 250L. 3 Surfboards, identical dimensions, but very different volumes. In reality, the thing that volume really tells us, is how “buoyant” the surfboard will be, and therefore how well the board will float you in the water. This matters because the higher a board floats you out of the water, the less drag your body will make when you paddle, and so the faster you’ll be able to move. The faster you can paddle, the more waves you can catch, and the less steep those waves need to be in order to catch them. 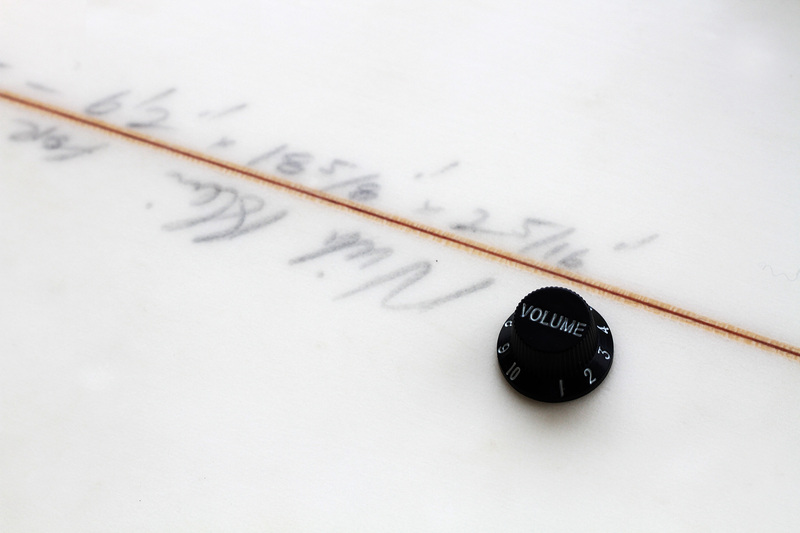 However, the volume of the board is only half the equation, the other part is the weight of the surfer, as a heavier surfer will need more volume to float him. An excellent question. Firstly, do not view any size of board as a “goal”, you should view a maneuver as a goal. Too many people view the size of their board, or lack there of, as a badge of their ability in the water. The problem is that while a smaller board is, in theory, easier to turn than bigger one, it is also easier to force bad technique on, which long term will hold you back far more than those extra 10 liters ever could. A board that is too small will paddle slow, catch waves late, bog down in turns, and generally make your surfing look terrible. A board that is too big on the other hand, has only one downside; if you’re technique is poor, you can’t cheat and try to torque the board round with your upper body. Smaller boards let you trim turns more easily, which can fool you into thinking your carving turns better but learning to carve turns is actually harder on a low volume board because you have less speed. Surfing bigger boards after an injury a few years ago, did more for my surfing than anything else, as it forced me to re-evaluate how I was using my body, and what I needed to change. Devon Howard demonstrating how good technique, not low volume, is the key to great surfing. So here’s what you should do; use this information to find a realistic starting point, to help you choose what board to ride, rent or buy. As a bit of a guideline, 2.0lbs/L is probably the smallest board that’s practical for learning in the white water, while 3.5-4lbs/L is probably the biggest board that most people can duckdive. The smallest I’ve been able to find anyone riding on a regular basis is around 6.6 lbs/L, with several world title contenders using some boards at this ratio. Here are some suggested minimum board sizes for different abilities (remembering that the higher the number, the smaller the board). More information on the Surf Simply Levels is available here.